In this series Fe Luton explores the ways in which you can set up and run areas of continuous provision. Ideas for organisation, resources and planning are explored. How should my maths area be arranged? The key with maths is keeping it real and purposeful. It is all too easy to just put maths ‘things’ in the maths area, without any context and while children will be drawn by interesting equipment, they need to see the point of it and how it is used in the real world. Maths is used in so many contexts that it is not hard to give children this understanding of maths in the real world: baking, fashion design, the post office etc. Maths also presents lots of opportunity for the development of communication skills and motor skills as well as creative opportunities and making sense of the world around them – nature is teeming with mathematics. What resources should I have in my maths area? Maths areas lend themselves to open-ended resources and an array of interesting objects and contexts. Make sure that you exploit this when considering your resources. Things to sort/count – having an array of interesting items available in the maths area may or may not entice children to count or sort unless given an explicit challenge to do so, but it will likely draw them over to investigate, and counting or sorting may become part of this. Have jam jars filled with small materials: shiny glass pebbles, shells, conkers, coloured matchsticks, pegs numbered, pipe cleaners for threading beads, buttons, and counters. Interesting sorting equipment – baking trays, egg carton, muffin tin, paper cake cases, compartmented trays all make sorting things far more exciting and real. Problem solving resources – resources for applying maths supports the development of mastery. This can be as simple as sorting out snacks for a given number of children. Data – children will be drawn to data if it is relevant to them and they feel they can create some kind of game or fun exploration from it. Resources such as Top Trumps cards will not only fascinate children, but will also have them comparing and reading numbers. The weekly football league tables also provide a fantastic (and interesting) array of data as do till receipts. Mathematical papers – have graph paper and table formats as well as an array of different shaped paper and folded paper. You could also have simple origami instructions. Number lines – make sure that these are available in different formats and sizes and that children understand how to use them. Maths equipment – the equipment that your children are familiar with and know how to use should always be available to them in the maths area, eg Numicon. 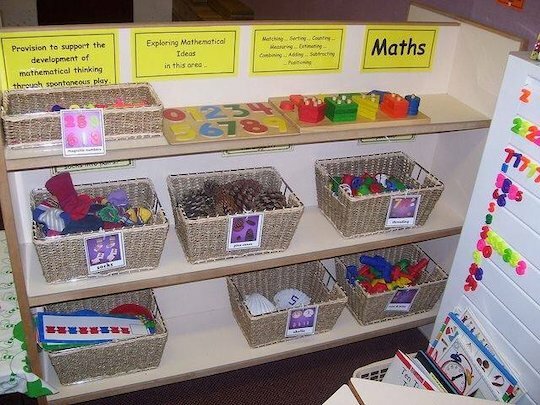 Movable maths – having a tray or basket that can be moved around may entice children to use maths equipment in other areas. For example having a basket or bag with a tape measure and ruler that is available to use in another area at a moment’s notice. Measuring materials – children are often drawn to real ‘grown up’ measuring equipment such as bathroom scales or kitchen scales, tool box tape measures, rulers, metre wheels, and things like light meters. They may not be able to initially use them accurately, but such exposure to measuring equipment and the associated numbers and units will build good foundations. Mathematical art resources – maths really lends itself to creative work. Shape outlines or templates and symmetrical outlines to add stickers onto to create, for example, a butterfly. Ensure that children can access this side to maths without having to visit the art area. Maths board games and dice – include an array of games and dice (dice with different numbers as well as shapes) for children to play with or make up their own games. Size resources – include resources such as Russian dolls, play dough, and straws or twigs of different lengths, in order to expose children to the mathematical language and problem solving associated with this area of maths. Numbered items – make them interesting! Numbered pegs, small slices of wood with numbers on them, a number album and shape album where children can ‘collect’ photos at school and at home to add in. Numbers can seem very bland to children, but the minute they are part of a more interesting resource they are more likely to be drawn to them and make them part of their play. Books – there are many story books such as Mr Archimedes’ Bath or The Shopping Basket that should be incorporated into your maths area. Maths apps and tablet games – this is a real draw and you can change them on a daily basis. Outdoor maths – try and create a maths corner in your outdoor area with a range of natural and larger scale resources.